Product information "Acidic bright copper plating solution"
With the bright copper electrolyte (acidic) from Tifoo, you will achieve a very bright copper layer on metal or conducitve surfaces. Please keep in mind that for all the material susceptible to acids (like e.g. 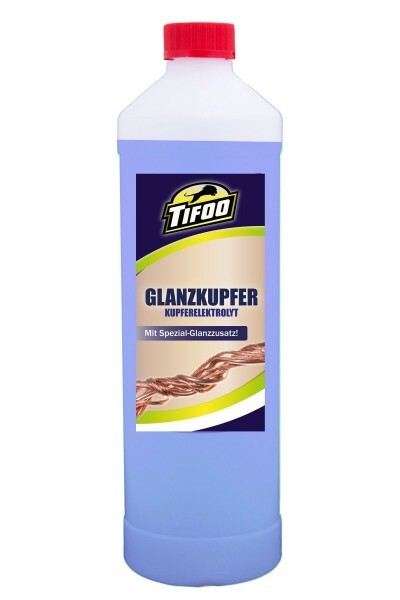 iron, steels, zinc or other base metals), it is better to use the Tifoo Copper electrolyte "alkaline"! ideal for the fabrication of printed circuit boards and circuit boards. You just have to use the copper electrolyte together with a graphite or copper anode and you already can copper-plate a component yourself. The acidic copper electrolyte is especially used for creating thick copper layers in order to use them as a basis for further surface refining. The gleaming effect is only achieved by using an immersion bath; if you use pen plating, the result will be matt. For being able to copper-plate zinc or other base-metals, please use the alkaline copper electrolyte. 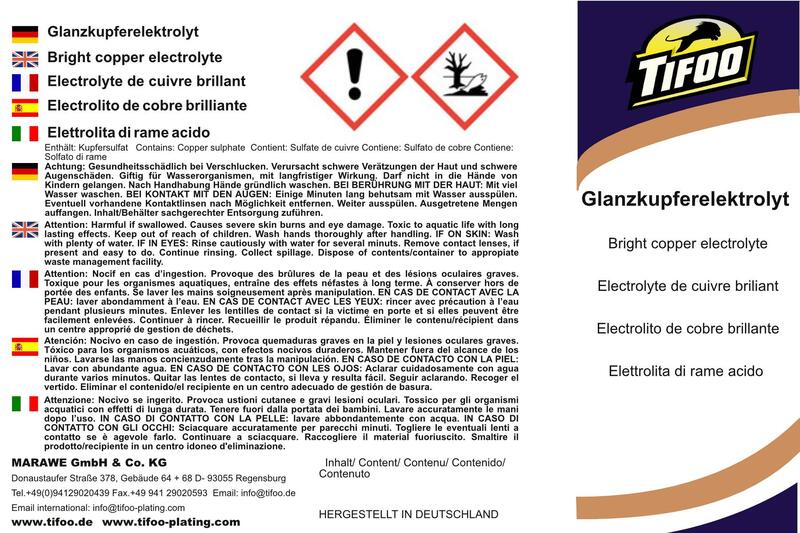 The acidic bright copper electrolyte is compatible with our complete galvanic kit. Please read also our instruction manual and security notes attentively before using the product (see links and downloads below). The brigth copper electrolyte is sent in a handy and reclosable 1 litre bottle which follows the UN security norms. On request, we will send you bigger packages and amounts of the product. Related links to "Acidic bright copper plating solution"
Instruction manual for Tifoo Acidic bright copper plating solution as PDF file. Customer evaluation for "Acidic bright copper plating solution"